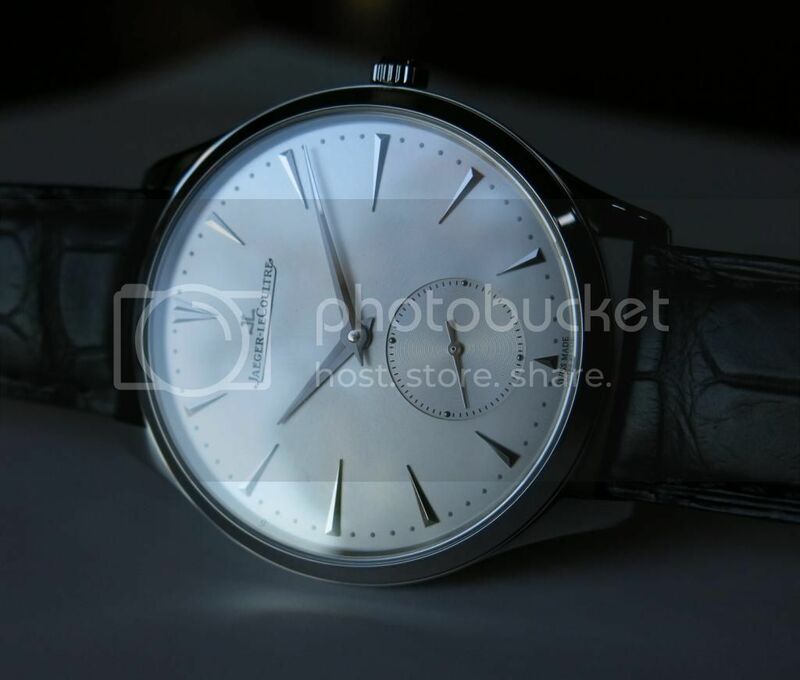 Let me introduce you to my new acquisition, a beautiful 38.5 mm Master Ultra Thin in stainless steel, Ref. 1278420. This time-only watch with a small seconds sub-dial is, in my opinion, a perfectly proportioned example of timepiece elegance. It complements the sportier and more rugged watches I wear daily and it will be my watch of choice for evenings and special occasions. My new MUT replaces a 39 mm MUT Moon, which I sold after discovering I didn't enjoy fiddling with the moon phase and date pushers every time I wore the watch. I loved the moon phase display but I eventually tired of setting it. My old brain never could recall which pusher set which function. If I weren't so OCD, of course, I could have just set the moon phase to look good and I could have ignored the date, which was nearly illegible to my old eyes anyway. The MUT Moon is a beautiful watch but it wasn't the perfect watch for me. I love the simple clean design of my new MUT and I think it's great that JLC offers a stainless steel version at a relatively modest price. But, although I love my new MUT, I'm not completely happy with everything in Jaeger-land. Because I have small wrists I requested a short version of the standard matte black crocodile strap, Ref. QC196759, only to be told that a short strap would not be available for an unknown length of time, perhaps 6 weeks. So, Jaeger LeCoultre delivers their new watches to authorized dealers but doesn't implement timely plans to accommodate buyers with smaller or larger than average wrist sizes? Really?! The MUT is nice to admire and I'm sure it will eventually be really nice to wear. Next Topic: Stainless JLC or Rolex vs gold Zenith, what would you do?